KENNEWICK, Wash. – It didn’t take long for Justin Ward to find his comfort zone in freestyle bullfighting. Just two months ago, he was part of the Bullfighters Only Development Camp in San Bernardino, Calif., learning the tricks of the trade. On Saturday night, he put together two winning bouts to upend a handful of veterans and win the BFO Tri-Cities Invitational in Kennewick. 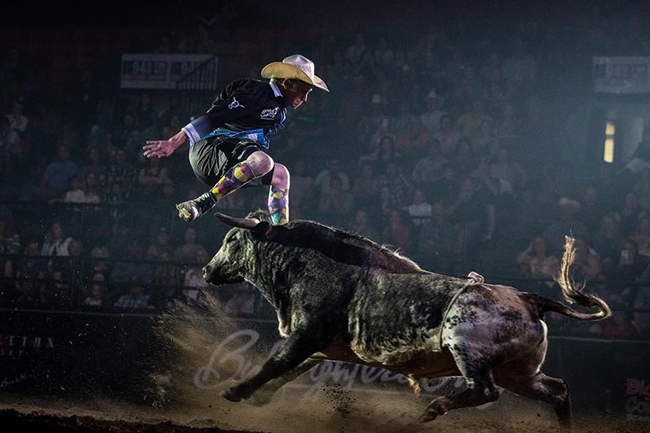 Ward was one of five rookies who were part of the Tri-Cities Invitational, and he escaped the rookie round with an 86.5-point fight to advance to the Hooey Championship Round. Once in the Hooey Championship Round, Ward posted a 91-point fight. It was more than enough to claim the Kennewick title. Ward outscored Beau Schueth, Kris Furr, Weston Rutkowski and Dusty Tuckness. Schueth, who has several victories under his belt, finished second in Washington with an 89.5-point fight. Furr, the No. 3 man in the Pendleton Whisky World Standings, finished third at 89, while Rutkowski, the two-time reigning BFO world champion, placed fourth with an 88. Not bad, especially for a young man just two months into his bullfighting career. He’s been working as a protection bullfighter for four years, and two mentors suggested he give freestyle bullfighting a shot. Round 1: Beau Schueth, 85 points. Round 2: Weston Rutkowski, 88 points. Round 3: Dusty Tuckness, 81 points. Round 4: Kris Furr, 86.5 points. Round 5: Justin Ward, 86.5 points. Hooey Championship Round: 1. Justin Ward, 91 points; 2. Beau Schueth, 89.5; 3. Kris Furr, 89; 4. Weston Rutkowski, 88; 5. Dusty Tuckness, 86.